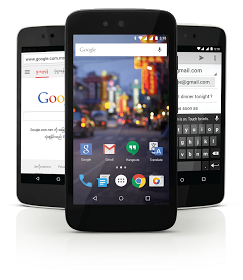 Google's Android One project which began last year in India has now launched in Myanmar. Another country joined Google's Android One Project. In this year's Google I/O , certain Android One problems were solved. Official Android Tweet says "Mingalabar AndroidOne is now available in Myanmar" . It seems as if Google is in force to back Android one project. In Myanmar Google has partnered with Cherry Mobile to launch Android One. As Google's promise is that Android One phones will soon receive Android OS Update as it is released. Now at the time of release of Android One with Cherry Mobile in Myanmar, the phone Will be running Android 5.1.1 Lollipop. I too use Android One phones, they are really nicely lined up with specifications. According to Google Asia Pacific Blog " Starting June 26, the Cherry Mobile One will be available for purchase through retail stores across Myanmar, with prices starting at Ks109,000. Google may be launching Android One in more countries this and coming months. Android One arrives to Myanmar.